Throughout the UK we are privileged to have such a vast array of professional dance companies and to see them perform in your hometown is something even better. One of those companies who come to mind instantly are Balletboyz. I remember the first time I saw them back in my third year of university at Warwick Arts Centre and saw them again only a few days after when they performed at the Curve Theatre. So when I heard they were making a return to Leicester this October with their new production, Life, I knew I couldn't miss them. The production is formed of two separate pieces, both different in foundations and creative influence but equal in both of their choreographic flare and energy. Since establishing the company back in 2000, directors Michael Nunn and Billy Trevitt have led their focus on creating new and surprising work for their audiences. With this new production they brought together Lidberg and de Frutos as part of their 'quest for variety'. However, there is some similarity in the way both of the choreographers discuss their work. Both think of themselves both as directors as much as a choreographer, honing in on ideas and emotions as well as the choreographic steps. Pontus Lidberg is someone who blends the contemporary and classical in relationship with screen and stage. He has created numerous dance works which have fed into his live work for companies such as Les Ballets de Monte Carlo as an example. He explored how to view the world through a camera lens, using this to aid him in his work as a choreographer gained him a momentum that made sense to work in film. The first piece Rabbit was very much a visually pleasing piece of work, which balances on the idea of the rich and strange on different levels. We witness a real change in the tempo from slow articulate movements that you see flow from the external to the internal, then to the extreme of speed the rabbits hopping and jumping in complete unison as a collective. This piece definitely explores the unknown of what you expect, there is a really strong string of events that makes it funny, dark as well as poetic and even heartbreaking all at the same time. Not matching up the movement to music is a curious and playful concept, especially when we've become a custom to watching dance move in time to every beat of the music and become comfortable with that. Lidberg works with his choreography and use of music being on different layers to one another in creating this piece and that 'choreography needs to be able to stand on it's own'. It's a piece of dance that is full of artistic, fluidity and flare but with a underlying structure that is so beautifully created. Moving onto the second piece of Javier de Frutos which is based around his own death, a freak accident. de Frutos is very much alive. He wanted to create a piece around the topic of death and it seemed impossible to kill off anybody else but himself. For his piece he commissioned his own obituary, written by dance critic Ismene Brown. We are witnesses to hearing about his career, the triumphs and the controversy. The dancers, wearing T-shirts and tracksuit pants and with only a barre on stage and minimal lighting this piece is very much focused on the spoken obituary as well as the actual choreography within the piece. Again the choreography and spoken word are very much disjointed as a relationship but also come together so well within this piece. We see a lot of aggressive and violent movement, a reflection of the bereavement the dancers have suffered. This piece can be assumed as a representation of de Frutos' state of mind as he assesses both of his life and his work, but in relative he intended to use the device of his topic to explore the broader questions about the inconvenience of death; not just the tears and memories. There's something within it's creative process as well as it's representation in movement that we can all relate to somehow if we've experienced death in someway. This piece had such a nice play with the use of cannon movement and playing with levels with the barre as a real centre/focal point for either the start or end of the movement phase they are moving through. 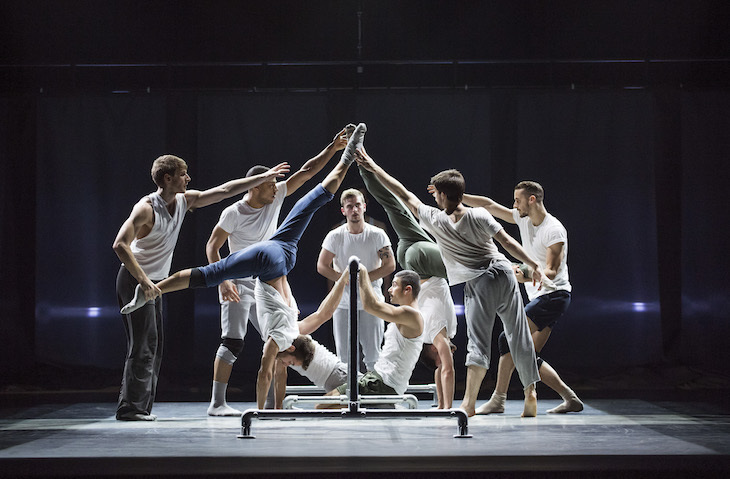 Balletboyz proved again why they're consistent and so much better everytime they present new work and they undertake powerful subjects in their production that are presented with maturity. 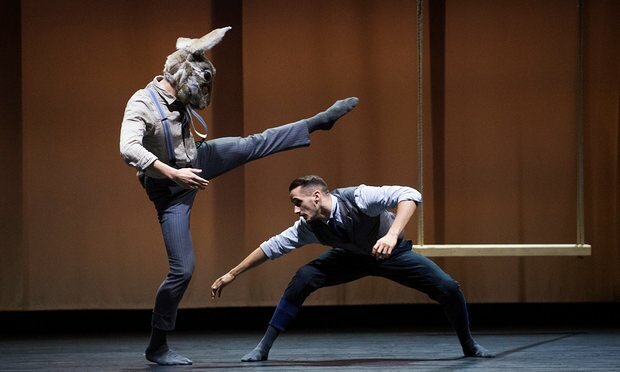 Balletboyz are performing at the Curve Theatre until Tuesday 25 October. You can read my pre-show interview with one of the Balletboyz company dancers, Matthew Sandiford here. Disclaimer: I was invited to watch Balletboyz at The Curve Theatre in Leicester in return for this post to be published. The photos are sourced from a google search engine.